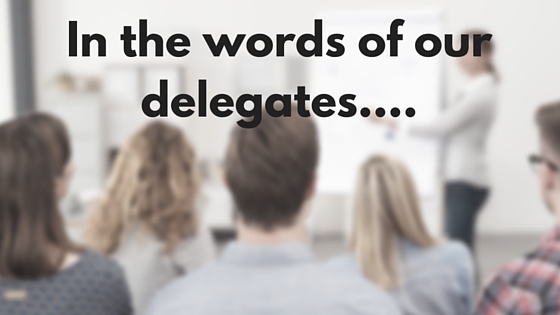 In the words of our delegates … what will you do differently as a result of this workshop? In the third article of this series, we are pleased to be able to bring you comments from delegates which summarise the expectations and learning outcomes from our 1 day in-house training course Developing Resilience: Training for Managers. The comments were gathered via online evaluations, enabling delegates to consider the benefits of the training before providing their feedback. Managers and Team Leaders were keen to attend this course to improve their approach to difficult situations and help their team members become more resilient, especially when faced with organisational change or increased workload. Following the training, delegates felt empowered to share the techniques with their team members to improve optimism and strengthen the resilience of their team members. Responding to situations rather than reacting and empathising with colleagues and employees were also highlighted as important actions. This course enables delegates to enhance existing resilience skills and learn new techniques to equip them to deal with challenges in the workplace. Throughout the course, delegates will consider how they can apply these skills to develop resilience in their teams. Why did you want to attend this workshop? What will you do differently as a result of this workshop?